Emerald & Obsidian - incognito! Every once in a blue moon, the moon turns blue. 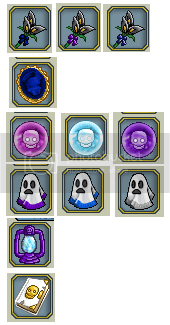 I think the two white gravestone fragments are slightly different, its really hard to tell so I'll just put both and let someone else figure it out :). All I know is that the Black Lilies are common. Just sold a purple Haunted Dinner Napkin in Hunter for 20K. ....And I know it doesn't worth like that. I've only been on 3, with only 2 porting; the lack of chests does make them not the most common, but the gravestone fragments are also common (two or more being awarded). Here is the next set, there shouldn't be any repeats. I'm colorblind, but here's a Napkin. Hrengito on all oceans, primarily Sage. Memmed: Sage(356/356).Viridian sea(25/282). Best solo recorded 2-stop 50L time: 60m. In opposition to aftcastles for sloops everywhere. 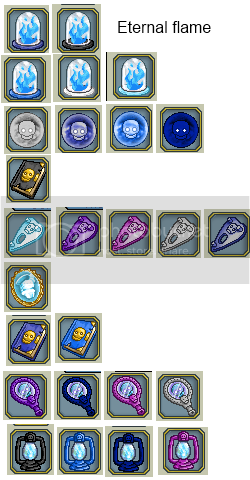 All this stuff looks great, but I can't ever find a HS run :/. If anyone wants to recruit me I'd be happy to join ye ^_^. "Did ye swab ye poopdeck after dropping ye anchor?" no more mass posts :( but here is one the wiki doesn't have. Does annyone know how much they worth??? This is not the proper forum for that discussion. This forum is about the YPPedia and keeping it updated. Please consult the Bazaar forum for your particular ocean, e.g. Sage Bazaar, Midnight Bazaar, etc. Prices will vary depending on ocean, although the major doubloon oceans (Sage, Viridian, Hunter) should have similar prices. Let me show it to ye this way, then. I agree, it looks awfully like grey, but I don't think they'd have 2 grey not next to each other in sort order. EDIT: I forgot to say that I do think that YPPedia has the sort order correct, but some proof of this from anyone (i.e. posting a complete color set) would be nice. Looks like the night blue has gotten lighter too, as it's slightly clearer than the one we have on the YPPedia right now. The inventory sort order is always the same order - if it's different for one trinket, that means it has to be different for all. So if things look weird, it's the colours that are weird, not the sort order. For comparison, the right-hand side of the navy planchette looks awfully grey. I also petitioned about it to verify, and Prometheus confirmed that the colors are not booched, but just an odd result of the way trinkets are colorized (which is totally lame, IMO, but whatever). 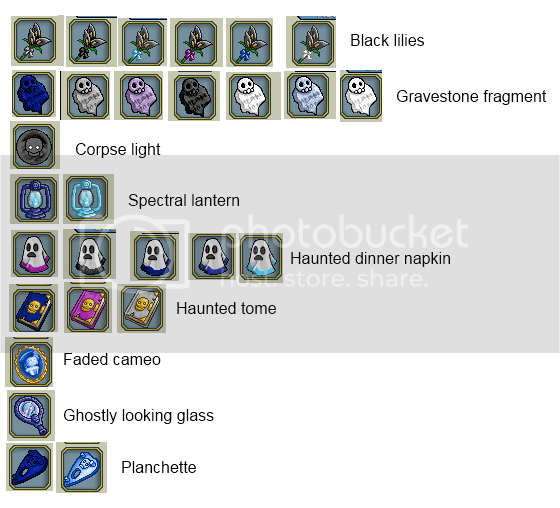 My earlier comment was based on the gravestone fragments, but upon further inspection all the HS trinket types, they appear to be the only one that is quirky. Like I said above, the planchette is similarly quirky, but only on the right-hand side. Those fragments are definitely confusing. Just to note it, the trading post marks value at 4k for the ring, 500 for the veils and 2k for the others. Seems they have default prices until the market forces shift them. Dear forum alt: since you inquired, no, I do not endorse ban evasion. I went on a trip this morning and took a screenshot of a whole bunch in the ahoy. Also got more off a hearty. I've made grids for them all. Curiously, I've seen three haunted candles, and all of them are identical. I'd be willing to posit that it's a colourless trinket, save that it actually looks blue, while the colourless trinkets in the CI and Atlantis sets are non-palette coloured.